This mod follows the full spirit of rFactor. Physics were updated to 2013 rules without altering the main rFactor feeling. After a few laps you will notice the realism that rFactor achieved back in 2007 but with all rules, teams and drivers from the 2013 season. Everything has been updated to follow the Formula 1 regulations in 2013: weights, fuel tanks capacity, rpm, power, pit stops, tyre wear and so on with the exception of: DRS and KERS because it forces you to use external programs that lower the yield and improve the feel of being there really riding. This mod has a lower incidence aereodinamica cars that will slipstream overtaking thereby causing a more pure and in the absence of KERS and DRS. This mod adds the Formula 1 2013 season, FormulaRS (for owner teams), GP2, Formula 3, Formula Factor (same as Formula Renault) and an extra series of F1 cars. The AI has been improved and calibrated so that the ability of drivers have been adjusted to allow a real racing experience in offline mode. If you want to know when your partner driver will stop just check the .gdb file (inside the location/nameofthecircuit folder). There are currently no setups for Formula1 2013 GP2 Formula3. Add a Setup. 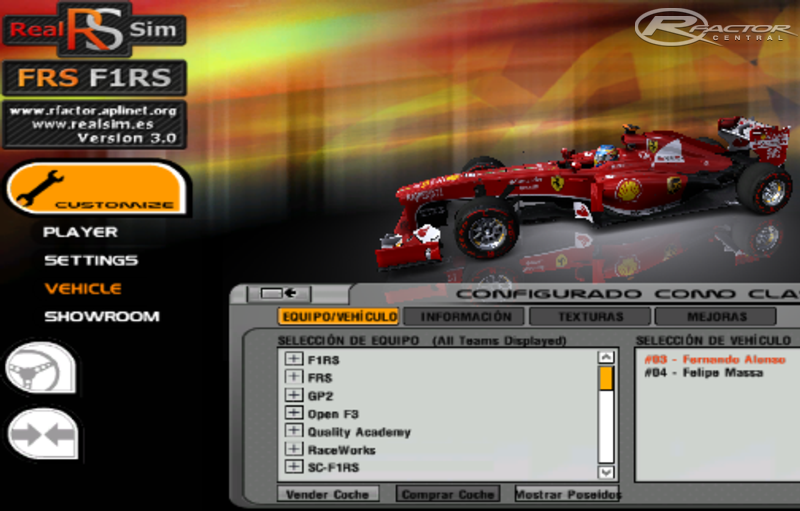 There are currently no car skins available for Formula1 2013 GP2 Formula3. If you are a painter you can share skins for this mod via the Car Skins area. Visit the Spray Booth for painting tips & tricks. Physics is so much vital in our daily life because many rules applied on it. Though it is known professional cv writer that you can learn from the basic kinds. I try repeat for you. If you run in race weekend may be you must reduce number of opponets to 5, if work to 10... Try this. Also try to enter a servers called RealSim, we run races x4-25% daily with 4 or 6 players. Also try with lowest graphic. Pleas let me know your progress. xauty, sure this mod work of any track, only i need more info for help to you. If you like try disabled rain plugin you can move to RFE folder RFE dll files, of rFactor/Plugin/ folder. And reverse for enabled plugin. Update rFactor to 1.255F same says rick if you don't have updated. And if you think you ram is fully try to add normal resolution textures choice. Download of oficial page downloads. anyhow... big thanks to the developers of this mod which I find kind of cool! You play offline when this fault? I dont have Windows 8 and the trackpack. Other mods worked fine without track packs. This comes offline, yes. This mod will not down load. I've managed to get the track pack to download but I have accessed the Mega website, clicked download and the screen shows downloading but it stays at 0%. Can anyone advise please? Ok, a few noses are not exactly accurate, but its ok for me. FInally a 2013 mod which is driveable! FastFalcon01 What is your windows version? May be you have a bad installed this mod. They is sure, sure independient mod of others with not FRS folder, all files of mod is in independent FRS folders. This mod has completely *****ed my game. Any other mod and/or track DOESN'T work. I want to uninstall it. Help?